A washing line prop. The long package, wrapped in black plastic, sitting in my kitchen was a washing line prop. A telescopic one dontcha know. A step up from the square wooden prop my Nanna had. The one that lived in a brackets attached to the fence, with a V cut out of the top and duck tape round the middle to protect the hands from splinters. Mine might be metal and telescopic, but it does the same job. It holds the line up to allow washing to dry higher in the air. And holding it my hands took my breath away. I’ve never lived anywhere with an outdoor line. 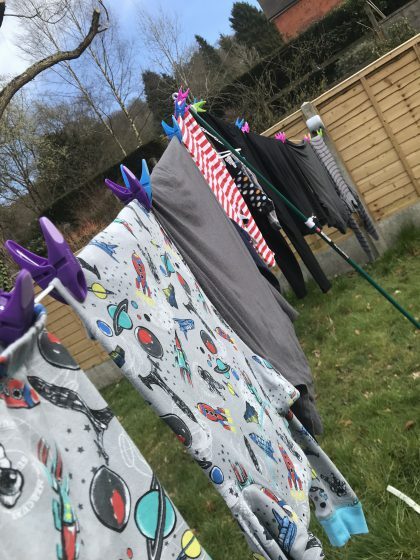 I’ve used metal stand alone airers and tumble driers all my adult life. I’ve wanted a line for a while. Well, since we got our own garden it seemed like the right thing to do. But every time I’ve tried to think about it, I’ve found reasons not to. A whirligig line would block my view, Oscar would pull on it etc etc. But this year (and since we have a new fence to hold it) I decided a retractable line stretched across the garden would be the solution. And then the prop arrived. I can’t really explain the feeling of holding it in my hands. I’m married, I’ve bought a house, given birth to my son and yet none of those things made me feel the passing of the years like holding that stupid prop. It literally took my breath away and I may have even teared up. Because here I was. A proper adult. With next to no idea how I got here. I’m not surprised things as innocuous as as washing line prop (which by the way I love. Long line drying is totally where it’s at!) are giving me cause to stop and catch my breath. This is my 40th year on earth and they say people often become more introspective in the year before a ‘big’ birthday. Big decisions get taken, big changes happen (and always one not to disappoint, I got married at 29). And something in me, in my 39 year old self is feeling all these things. Introspective, questioning, anxious, just trying to hold on, in the face of a violently changing tide. Maybe a prop is just what I need to help me do that. And maybe the part of me that doesn’t want to hold on, that just wants me to let go and change with the tide, knows it too. And maybe it’s that, that makes me gasp.